A reader, book lover, writer and critic, Upasika Khun Ranchuan Intrakamhaeng has instilled Thailand with a love of reading by helping to establish libraries, schools and literacy promotion programs including a radio and television program in 1957 aimed at promoting literacy. For these efforts she received the royal medal of Chatuta Chulachomklau in 1969 and later the Tatiya Chulachomklau medal. 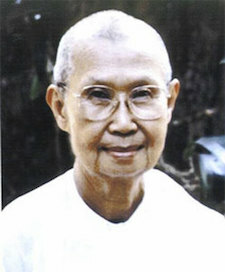 Since 1981 she devoted herself to monastic life training at Wat Nong Pa Pong in Ubonrachatanee under Achan Cha Supatto and then at Suan Mokh in Surat Thani with Buddhadasa Bhikkhu. She taught Dhamma to Thais and international students, and has produced a Dhamma television program on TV 11 from 1987 until the present. Thus, she was awarded for eloquence in Thai language usage by Krom Prachasampan and related organizations on National Thai Language Day 2001. Ubasika Khun Ranchuan Intrakamhaeng has authored more than 20 Dhamma books and received the Narathip Award as an Outstanding Senior Writer from the Writer’s Association of Thailand. Now at the age of 84 she lives a monastic life at Wat Nong Pai in Sakon Nakorn.